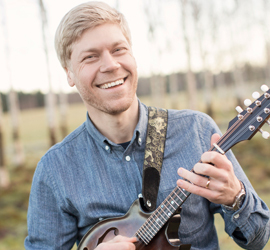 Magnus is one of Scandinavia’s foremost mandolinists and also plays guitars, cittern and other instruments from that family. He is also in demand as an accompanist and in recent years has made albums, concerts and TV appearances with Esbjörn Hazelius, Malin Foxdal, Tomas Ledin, Sofia Karlsson, Quilty, Rostam Mirlashari, Dan Viktor, The Tarantula Waltz and Kersti Ståbi. In 2014 he got a gold record award for his work with Tomas Ledin´s Swedish Grammy award winning record ”Höga Kusten”. As a performing musician Magnus has also worked with Riksteatern, Cirkus Cirkör, Västanå Teater, Clowns without borders and Gävle Folkteater. In 2007 Magnus became the first Swedish mandolinist to graduate from higher education when he completed his studies at the Royal College of Music in Stockholm and the Sibelius Academy in Helsinki. Today he teaches mandolin and guitar students at the Royal College of Music. Magnus also plays with improvisation group Primus Motor together with Filip Jers, harmonica, and Johan Lindbom, double bass.